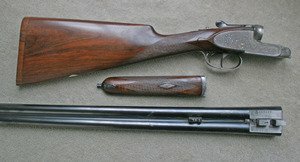 This top quality sidelock shotgun was made in 1979 and has all the features expected . Auto safety with gold inlay, cocking indicators with gold inlay, articulated trigger with a rolled guard. These guns now cost almost Â£6000. If you are a six footer and expect a quality gun â¦â¦. â¦â¦â¦â¦â¦â¦â¦â¦â¦â¦â¦.. you won't find a better example at this price.